When you chose Augustine’s Adventure Africa as your safari host, you're our esteemed guest. We take each and every possible measure for your safety. We do all that we can to ensure your comfort, safety and the highest level of enjoyment. To facilitate this, we include the Service of The AMREF Flying Doctor Service based in Nairobi Kenya. This is the largest and best-known Air Ambulance Service in the region. With a dedicated fleet of aircraft, the Flying Doctor Service provides 24 hour Air Ambulance service in East Africa. All their air ambulance aircraft are fully equipped with certified stretcher systems and carry modern medical equipment including transport ventilators, electronic monitoring equipment, trauma equipment, medical supplies and drugs, for professional ICU patient transport. Full time medical staff and aircrew are on standby 24 hours to respond to emergencies. Patients will be accompanied by an emergency physician and/or critical care nurse, who have all worked for several years in intensive care medicine, are certified in advanced life support and have long-standing aero-medical experience. With their largest radio network (some 120 high-frequency stations), we can reach AMREF Flying Doctors from hospitals or tourist lodges in remote locations, for a quick evacuation. When you're traveling with US within East Africa (Kenya Uganda and Tanzania), Rwanda and Burundi (anywhere within a maximum of 500-1000km's of Nairobi) you are covered by the service. Medical facilities outside cities are few and far between and many rural hospitals do not have facilities for critical care. In the case of a medical emergency, life threatening siyuation, getting to a well-equipped hospital fast could mean the difference between life and death. AMREF Flying Doctors Service operates 24 hours, 365 days a year. Full-time medical staff and aircrew are on standby to respond to emergencies. 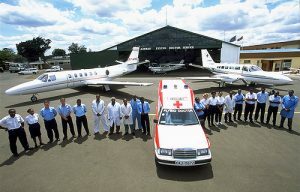 In case of a medical emergency that requires an evacuation from a remote area, the Flying Doctor Service will send a medical team and evacuate you to Nairobi Wilson Airport where you will be transported by an ambulance to a hospital in Nairobi (THE FLYING DOCTORS SERVICE DO NOT COVER THE COST FOR HOSPITALISATION). We strongly advise all of our guests to enroll/buy insurance that covers you on various things including, illness while traveling, accidents, theft, etc. You can visit www.insuremytrip.com for a good comparison of different travel insurance companies.